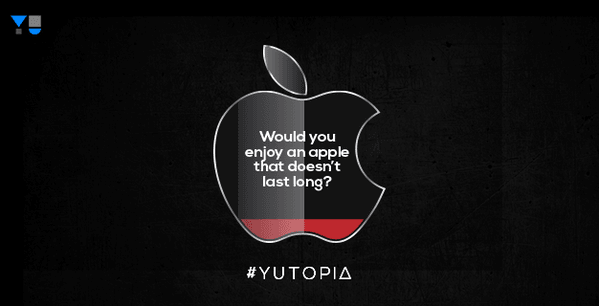 YU has been teasing its upcoming smartphone, the Yutopia, for a while now. In its latest teaser for the flagship, YU has mocked Apple iPhones for their battery performance. It looks like YU’s strategy to hint users that the Yutopia will feature a big battery. It could be the main selling point for the device as well, as who wouldn’t look for a smartphone with high battery capacity. To recap, in its previous teasers, YU had also revealed that the Yutopia will come in metal unibody design with chamfered edges. Other teasers for the smartphone also stated that the device might also feature QHD screen, and fast charging technology. The YU Yutopia is being dubbed as the company’s first flagship smartphone, so it might be priced higher than the 10k bracket, unlike previous devices by YU. The pre-registrations for the device have already begun on YU’s website, and this time has no plans to sell it via flash sales. The YU Yutopia is expected to run Android 5.1.1 Lollipop-based Cyanogen OS 12.1, and feature a 5.2-inch display with a resolution of 1,440 x 2,560 pixels, a 64-bit octa-core Qualcomm Snapdragon 810 processor, 4GB RAM, 32GB internal storage, 4G LTE connectivity, a 21-megapixel primary camera with 4K video recording, and an 8-megapixel secondary camera. If these specifications turn out to be true, the device will compete with the likes of the OnePlus 2, the Samsung Galaxy Note 5, the Motorola Moto X Style, and the Sony Xperia Z5. Recently a guy’s micromax phone got exploded in Bhopal and burned his thigh. What right YU has, to mock Apple??? Every company has faced this phone blast problem incidenys,be it Apple IPhone or Samsung Smartphone so get your facts r8 before commenting…..